This planimeter tool can be used to measure the enclosed area of a defined polyline on a map. You can click the [Delete Last Point] button if you make a mistake or click [Clear All] points to remove all points from the map and start again. You can also reposition the markers after they have been placed on the map by dragging and dropping them. The area calculator tool allows you to find out the area that is enclosed inside a closed polyline overlaid on a map. A measurement of Lough Neagh in Northern Ireland. 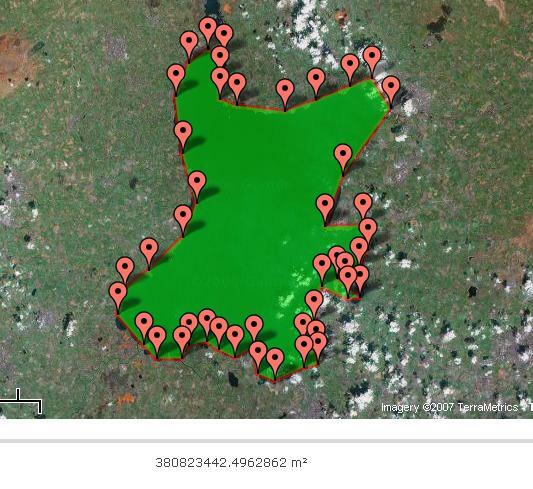 Lough Neagh is reported to have a surface area of 388 km²  , so the reading of 380 823 442m² isn't far off. Thanks I use this tool to check areas when doing quotes as often the areas go beyond boundaries and otherwise I cant get an accurate area size. Most useful. I really cant mention. Brilliant tool! helped me out so many times. Showing the most recent 20 out of 1295 comments. Click to see all the comments.